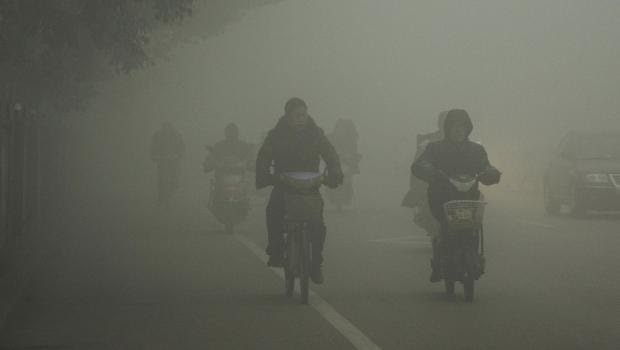 The cost of air pollution in China has been estimated at 6.5 percent of GDP. 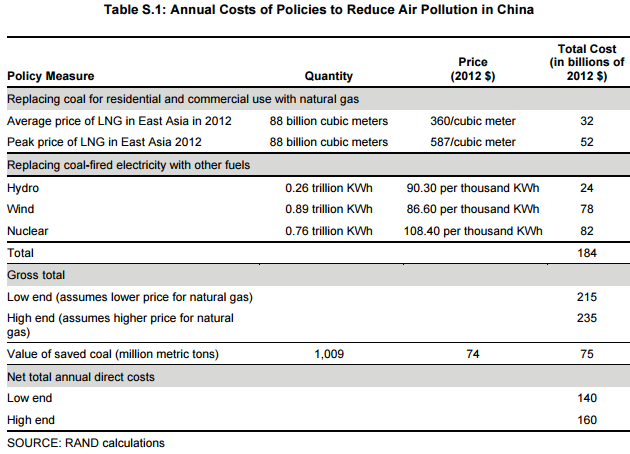 Applying that figure to China's GDP of $8,227 trillion dollars in 2012, the year on which we base much of our analysis, implies that reducing air pollution in China to levels considered acceptable by WHO would yield annual benefits of $535 billion. As incomes rise and China becomes more urbanized, these costs are rising. China's GDP including Hong Kong and Macau will be about $11.6 trillion in 2015. This would mean the cost of the air pollution would be $750 billion. Replacing coal used for residential and commercial use and about half of all coal used to generate electricity in 2012 would have resulted in a decline in coal use of 1.009 million metric tons, representing 27 percent of Chinese coal consumption that year. The cost of replacing half of coal-fired power with water, wind, and nuclear power at $184 billion.